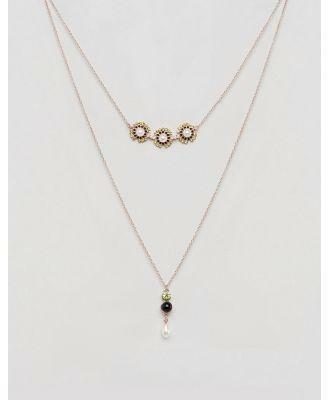 Necklace by Johnny Loves Rosie, Rose gold-tone finish, Fine chain, Multi-row design, Adjustable chain length, Lobster clasp fastening, 50% Alloy, 48% Glass, 2% Plastic. Renowned for its signature floral corsages, Johnny Loves Rosie channels a cute vintage aesthetic. Shop its all-occasion lace bows and silky Alice bands for whimsical, ultra-girly design, or dress for the big day in beaded headbands and gem-encrusted hair slides.